The photo above was taken in Ellis Island sometime between 1902 and 1913. 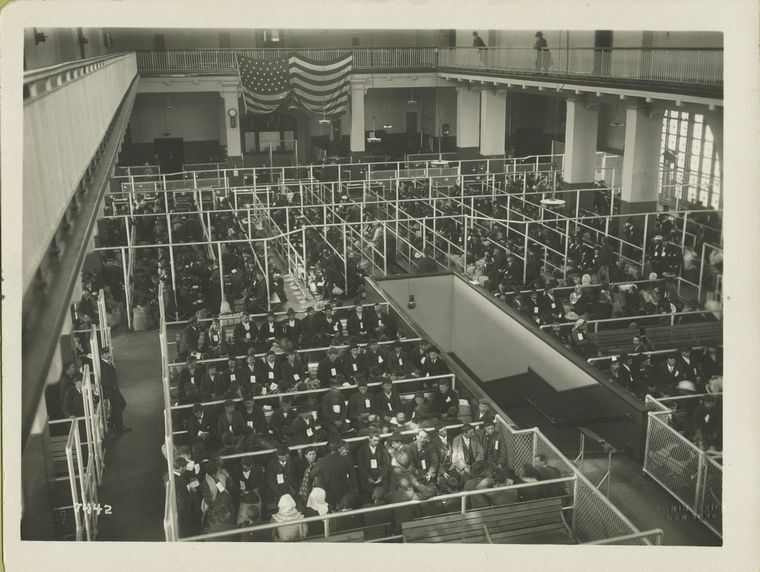 It’s titled “The Pens at Ellis Island.” Photographer unknown. What I like about the photo is how much it shows us about our country. It shows–as if we needed reminding–that we have always been a country of immigrants. But it also shows that we have not always treated immigrants with the respect they deserve. I like that there is an American flag in the background, but that rather than flying it sags, the weight of its cloth pulling it toward the ground. I like, too, how orderly the photo appears to be. In his post-9/11 book Hold Everything Dear: Dispatches on Survival and Resistance, John Berger wrote, “There is a very direct relation today between the minutes of meetings and the minutes of agony.” Trump’s executive order is a document that at its face appears to be orderly, efficient, even bureaucratic, but that is in fact an act of violence.